and Spring binaries using following maven file. 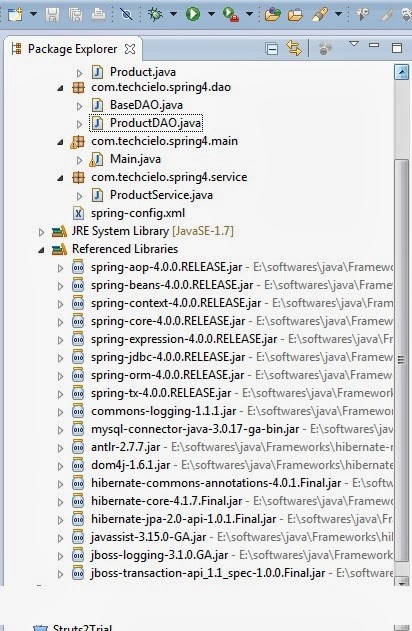 Step 2 Create a configuration file (if you are using eclipse create this file in src folder and if this is web application it can go anywhere in WEB-INF but need to configure the same in web.xml ) to tell Spring context factory what packages it need to look for beans configured using annotations. Here we will use 2 different annotations to distinguish between service layer, DAO layer (if this would have been a web application we have user third annotation @Controller). We will be using annotation @Service for service class and @Component for DAO class. Remember all these annotations can be used interchangeably. Notice that we have given annotation @Component and provided id prodDAO by which Spring container will wire this class to other classes. We will use BaseDAO to store information about Hibernate SessionFactory information configured in our xml file, but for now we will focus on injecting this class in service class ProductService as shown below. Here our service class is identified by annotation @Service and is given id prodSvc, also bean identified by prodDAO is attached to it by annotation @Autowired. Now we will write a class to test if this code is working or not. So following class will get an instance of service class and will call method getProduct of this instance. When we run this class following will be output. Now we will actually hit the DB and get the details about entiry Product and will print the same in our Main class. 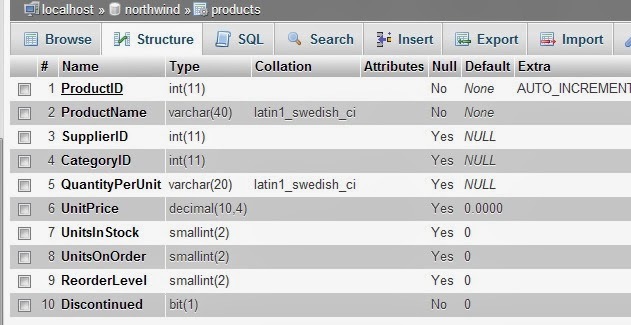 In order to do this we will use openly available database called NorthWind. (Going forward to understand different relationships in hibernate we will be using same database). Now we will create one entity class (to make it simple we will select an entity which has no dependency) for Table Products and we identify it as Product. Following is the table structure. First we will take only two fields ProductId (as an identifier) and ProductName. Rest of the fields we will use in consecutive sections to establish different relationships in hibernate. Annotation @Entity tells Hibernate configuration that this is hibernate entity, @Table annotation tells which table this entity is attached to @Id tell which instance variable (in this case prodID) will be used as identifier for this class. @Column annotation tells to which column respective local variable will be attached to. Now we will add this class information in spring configuration file’s sessionFactory bean by changing it as follows. After this step following will be our eclipse project structure. This change tells session factory that class Product is hibernate entity with annotations and need to be interpreted accordingly. Now time to change our DAO class and get the product from DB for which id is passed. So lets change getProduct method of this class as follows. And in main class we get this instance and print value of this instance. And when you run this class following will be output. Hibernate: select product0_.ProductID as ProductID3_0_, product0_.ProductName as ProductN2_3_0_ from products product0_ where product0_.ProductID=?